This paper argues that social transformation processes generate shifts in public opinion among the public. More specifically, increasing rates of modernization and globalization in the Arab world over the past half century have led to a moving away from religion, tradition, and ethnocentrism to embracing more secular, liberal, and egalitarian values. Ordinary citizens in today’s Arab world are more tolerant towards non-Muslims, Americans, and other Westerners more than ever before. They support recognizing Israel as a state at a rate previously unprecedented in the region. Arabs are politically, socially, and culturally more liberal than they have been in the twentieth century. Evidence from the World Values Survey and Arab Barometer clearly convey this observable value change in the region. Underlying causes for this change are arguably due to macro, mezzo, and micro-level changes in peoples’ lives resulting from increased modernization and globalization compared to earlier periods. 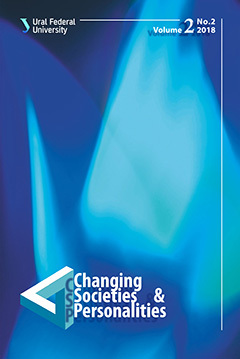 This confirms earlier findings from Western Europe and North America, which propose that social transformation processes, yield predictable changes in values among mass publics. Malek Abduljaber, PhD, is professor at Saginaw Valley State University, Ann Arbor, USA. He is a researcher on Middle Eastern Politics. His work considers the interaction of social transformation processes such as globalization and modernization and political ideology. He is also the author of numerous articles on public opinion change in the Arab World. Dr. Abduljaber holds a doctorate in political science from Wayne State University. Acemoglu, D., Hassan, T., & Tahoun, A. (2017). The Power of the Street: Evidence from Egypt’s Arab Spring. The Review of Financial Studies, 31(1), 1–42. Arat, Z. (1988). Democracy and Economic Development: Modernization Theory Revisited. Comparative Politics, 21(1), 21–36. Bartolini, S., & Mair, P. (2001). Challenges to Contemporary Political Parties. In: L. Diamond & R. Gunther (Eds.). Political parties and democracy (pp. 327–343). Baltimore, MD: Johns Hopkins University Press. Bayat, A. (2013). Life as Politics: How Ordinary People Change the Middle East. Palo Alto, CA: Stanford University Press. Bolleyer, N., & Storm, L. (2010). Problems of Party Assistance in Hybrid Regimes: the Case of Morocco. Democratization, 17(6), 1202–1224. Bordoloi, S., & Das, R. (2017). Modernization Theory. In: The International Encyclopedia of Geography. Willey-Blackwell and the Association of American Geographers. Braizat, F. (2005). Post Amman Attacks: Jordanian Public Opinion and Terrorism. Amman: Public Polling Unit, Center for Strategic Studies. Campante, F., & Chor, D. (2012). Why was the Arab World Poised for Revolution? Schooling, Economic Opportunities, and the Arab Spring. The Journal of Economic Perspectives, 26(2), 167–187. Ciftci, S. (2012). Secular-Islamist Cleavage, Values, and Support for Democracy and Shari’a in the Arab World. Political Research Quarterly, 66(4), 781–793. DOI: 10.1177/1065912912470759. Dabashi, H. (2012). The Arab Spring: Delayed Defiance and the End of Postcolonialism. London: Zed Books Limited. Hamarneh, M., Hollis, R., & Shiqāqī, K. (1997). Jordanian-Palestinian Relations: where To? Four Scenarios for the Future. London: Chatham House. Harik, I. (1987). Some Political and Cultural Considerations Bearing on Survey Research in the Arab World. In: M. Tessler et al. The Evaluation and Application of Survey Research in the Arab World. Boulder, CO: Westview Press, 1987. Hudson, M. (1995). The Political Culture Approach to Arab Democratization: the Case for Bringing it Back in, Carefully. Political Liberalization and Democratization in the Arab World, 1, 61–76. Inglehart, R., & Welzel, C. (2005). Modernization, Cultural Change, and Democracy: The Human Development Sequence. Cambridge, UK: Cambridge University Press. Jackman, S. (1998). Pauline Hanson, the Mainstream, and Political Elites: the Place of Race in Australian Political Ideology. Australian Journal of Political Science, 33(2), 167–186. Kitschelt, H. (1997). The Radical Right in Western Europe: A Comparative Analysis. Ann Arbor, MI: University of Michigan Press. Langohr, V. (2002). An Exit from Arab Autocracy. Journal of Democracy, 13(3), 116–122. Lerner, D. (1958). The Passing of Traditional Society: Modernizing the Middle East. New York, NY: Free Press. Levitsky, S., and Way, L. (2002). The Rise of Competitive Authoritarianism. Journal of Democracy, 13(2), 51–65. Lindberg, S. (2006). Democracy and Elections in Africa. Baltimore, MD: JHU Press. Lipset, S., & Rokkan, S. (Eds.). (1967). Party Systems and Voter Alignments. New York: Free Press. Lynch, M. (2013). The Arab Uprising: the Unfinished Revolutions of the New Middle East. New York, NY: Public Affairs. Malik, A., & Awadallah, B. (2013). The Economics of the Arab Spring. World Development, 45(C), 296–313. Marinov, N. (2012). Voter Attitudes when Democracy Promotion Turns Partisan: Evidence from a Survey-Experiment in Lebanon. Democratization, 20(7), 1297–1321. DOI: 10.1080/13510347.2012.690096. Marsh, R. (2014). Modernization Theory, Then and Now. Comparative Sociology, 13(3), 261–283. Moreno, A. (1999). Political Cleavages: Issues, Parties, and the Consolidation of Democracy. Boulder, CO: Westview Press. Nisbet, E., & Myers, T. (2011). Anti-American Sentiment as a Media Effect? Arab Media, Political Identity, and Public Opinion in the Middle East. Communication Research, 38(5), 684–709. Robbins, M., & Tessler, M. (2012). The Effect of Elections on Public Opinion toward Democracy Evidence From Longitudinal Survey Research in Algeria. Comparative Political Studies, 45(10), 1255–1276. Ryan, C., & Schwedler, J. (2004). Return to Democratization or New Hybrid Regime? The 2003 Elections in Jordan. Middle East Policy, 11(2), 138–151. Stoll, H. (2004). Social Cleavages, Political Institutions and Party Systems: Putting Preferences back into the Fundamental Equation of Politics. (Unpublished Doctoral Dissertation). University of California, Santa Barbara, Department of Political Science. Telhami, S. (2006). Annual Arab Public Opinion Survey, February. College Park: University of Maryland, Anwar Sadat Chair for Peace and Development. Tessler, M. (2003). Arab and Muslim Political Attitudes: Stereotypes and Evidence from Survey Research. International Studies Perspectives, 4(2), 175–181. Tessler, M. (2011a). Public Opinion in the Middle East: Survey Research and the Political Orientations of Ordinary Citizens. Bloomington, IA: Indiana University Press. Tessler, M. (2011b). Popular Views about Islam and Politics in the Arab World. International Institute Journal, 1(1). Retrieved from: http://hdl.handle.net/2027/spo.11645653.0001.101. Tessler, M., & Jamal, A. (2006). Political Attitude Research in the Arab World: Emerging Opportunities. PS-Washington, 39(3), 433. Tessler, M., Jamal, A., & Robbins, M. (2012). New Findings on Arabs and Democracy. Journal of Democracy, 23(4), 89–103. Tipps, D. (1973). Modernization Theory and the Comparative Study of National Societies: A Critical Perspective. Comparative Studies in Society and History, 15(2), 199–226. Warwick, P. (2002). Toward a Common Dimensionality in West European Policy Spaces. Party Politics, 8(1), 101–122. Weiner, M. (1966). Modernization: The Dynamics of Growth. New York: Basic Books. Zogby, J., & The Foundation for Arab Thought. (2002). What Arabs Think: Values, Beliefs and Concerns. Washington, DC: Zogby International.